A COMPLETE ALL-INCLUSIVE PACKAGE GETS YOU ON AIR IN MINUTES! This package is based on our CyberMaxFM+ SE+ V2 rack mounted FM transmitter series for demanding broadcasters operating in the 87.5 to 108MHz band. It contains our reliable FM transmitter with optional DSP stereo and RDS, an antenna, coaxial cable and all connectors. 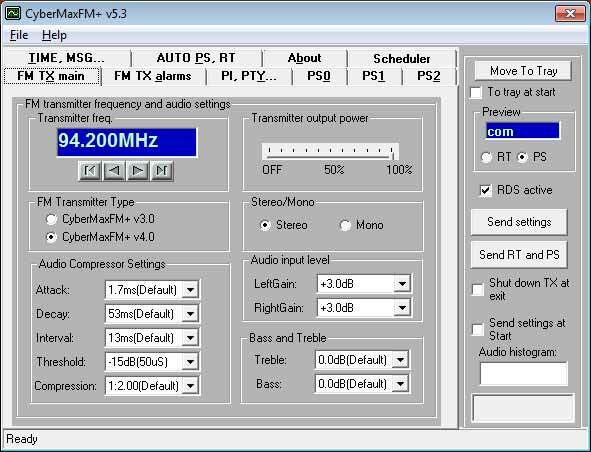 A perfect FM transmitter for a regular licensed radio station, medium size radio station, campus radio or a religious radio. Also very suitable for Africa and other remote locations. Protected with Temp and SWR protection. The best value for your money. - Includes coaxial cable and antenna! It is never easy to predict range. 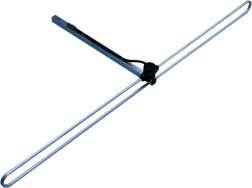 Exact range depends a lot on terrain configuration, type of antenna and especially the location of the antenna, coaxial cable quality and length and of course quality of receivers. Check this link to get a rough idea of factors involved. What parameters can I change via PC remote control? 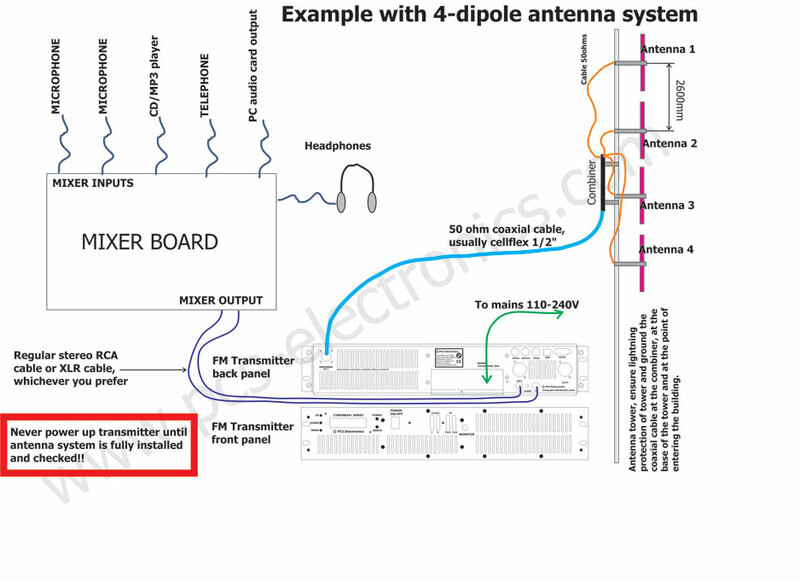 How do I wire up the transmitter, antenna and audio sources? Look at the image below (click to enlarge) for an example of a nice radio station with some studio items. At the bottom of this page look for the links to other items that you can use to setup your radio station (WHAT ELSE WILL I NEED AND IT WASN'T INCLUDED? and WHAT CAN I USE AS AUDIO SOURCE?). Radio Data System, basically it displays station name and sometimes song name and similar information on a compatible radio receiver. Very popular in Europe, less so in the US. Requires connection to a PC at the time of programming, but retains settings even when powered off. RDS requires RDS upgrade option so be sure to add it, if you need it. What is the Ethernet control module? This optional add-on module lets you connect this FM transmitter to Ethernet. It lets you control frequency, power and RDS parameters from your PC remotely. What is the Ethernet remote control module with IP audio for? - This add-on card lets you connect this transmitter to the PC via Ethernet network and it also lets you receive IP stream. This is basically Barix IP module inside your transmitter. Can be used on its own to receive streamed audio. To use remote control and audio streaming requires Barix Extreamer on the transmitting side in your studio. Need audio processor? Check these. Need a link from studio to the transmitter site? How about these. Important: Due to large size and irregular shape of these packages the website often gets shipping cost wrong. For exact shipping cost please contact our sales department, be sure to give them your exact address and they will quote you shipping. It also does not hurt to ask for a special discount. Also recommended: We recommend AA-230 ZOOM antenna analyzer for checking SWR of the antennas. Grounding kits can be purchased here, they ensure lightning protection. 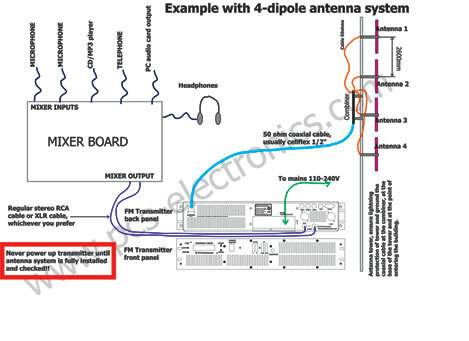 They should be installed at the antenna (if needed, most dipoles are grounded anyway), at the tower base and at the point of entrance into transmitter building. Also use self-sealing tape which turns into rubber and protects against moisture from entering your connectors and coaxial cable. WHAT CAN I USE AS AUDIO SOURCE? - Your PC. Just plug audio cable into your sound card. WHAT ELSE WILL I NEED AND IT WASN'T INCLUDED? - Requires mains cable, which can be purchased in your country (each country has a different mains plug and we don't carry all). This is standard cable used in your PC for example and its price is typically around 1 US$ or less. You can get it in any electronics store, such as radio shack, circuit city, any computer store etc. Mains cable simply plugs into the transmitter, just like it does with your PC, there is no soldering involved. This product was added to our catalog on Monday 23 January, 2006.